Beach Day Tye Dye! - April Technique Challenge! This is a look back to a previously released stamp and the Technique Junkie April Challenge with the Tye Dye technique from here - http://www.patstamps.com/tutorials_artwork/04-14/Tie_Dye_Circles_Tutorial.pdf. I added a light bit of sponging between Tye Dye circles just so it wasn't so stark white. I used two stamps from the Technique Junkie stamp line. The focal image is Seagrass Lighthouse - http://techniquejunkies.com/seagrass-lighthouse/ . The verse is Beach Day - http://techniquejunkies.com/beach-day/. I used Copic markers to color the focal image, and sponged in the sky. Lots of layers, and a ruffled ribbon finish the card. Have you tried this April Challenge? It is easy! Have a great day and get inky! Like many of you I purchased the new set of Distress Oxide ink pads and reinkers. The good news is that i have mine and I would guess many of you are still waiting for yours to arrive. 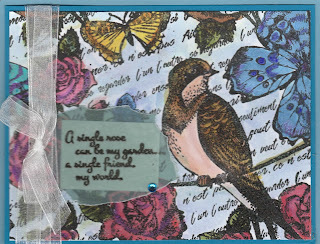 They are sold in Pat Huntoon's Technique Junkies store - http://techniquejunkies.com/12-pack-of-ranger-tim-holtz-distress-oxide-in-pads/. The reinkers are available here - http://techniquejunkies.com/search.php?search_query=distress+oxide+reinker . I used the pads to create a background like the Antique Glimmers technique. Then I inked the Technique Junkies stamp - Birds On A Branch Silhouette - http://techniquejunkies.com/birds-on-a-branch-silhouette/. 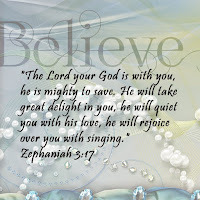 I used the verse Hope is the Thing - http://techniquejunkies.com/hope-is-the-thing/. Both stamps were heat embossed with detail black embossing powder. The focal image was layered, the verse punched out and layered and bling attached. I used a lovely stencil and Nuvo Glimmer paste to create this focal image panel. http://techniquejunkies.com/nuvo-products/?sort=featured&page=2 . The Technique Junkies stamp is called Unicorns and Sparkly - http://techniquejunkies.com/unicorns-and-sparkly/ . The verse is heat embossed with detail black embossing powder. This is such a cute saying and can be used for a variety of occasions. A ribbon bow was added for interest. 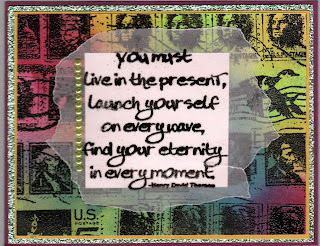 I used these two Technique Junkies Stamps - Return to Sender - http://techniquejunkies.com/return-to-sender/ and Live in the Present - http://techniquejunkies.com/live-in-the-present/. 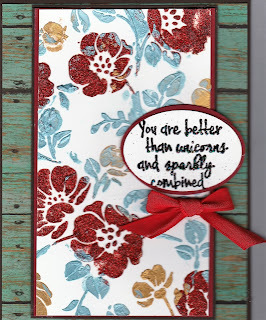 To create this card I used several cans of Art Anthology Coloration sprays - http://techniquejunkies.com/products-and-accessories/art-anthology-products/. I just spritzed the spray, heat set to dry (you can just let them air dry). I used my MISTI to stamp and restamp in exactly the same position until the stamped image was clear, crisp, and dark. The verse is stamped on vellum, and heat embossed on vellum. I layered it over some white card stock and adhered it to the focal image of the card. A string of beads were added for interest. 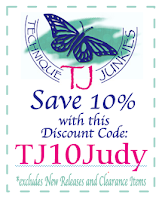 By now you should know if you use this code TJ10Judy you will receive 10% off of your order (with the exception of clearance and Distress Oxide products. 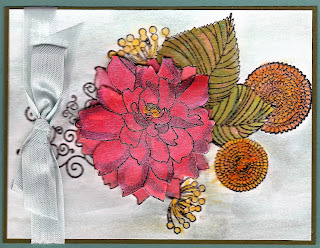 This lovely Technique Junkies stamp is Flourished Floral - http://techniquejunkies.com/flourished-floral/. I stamped it twice paying close to inking up the center flower the second time. I fussy cut the flower and popped it up with dimensionals being careful to not place in the exact same position as the flower beneath. 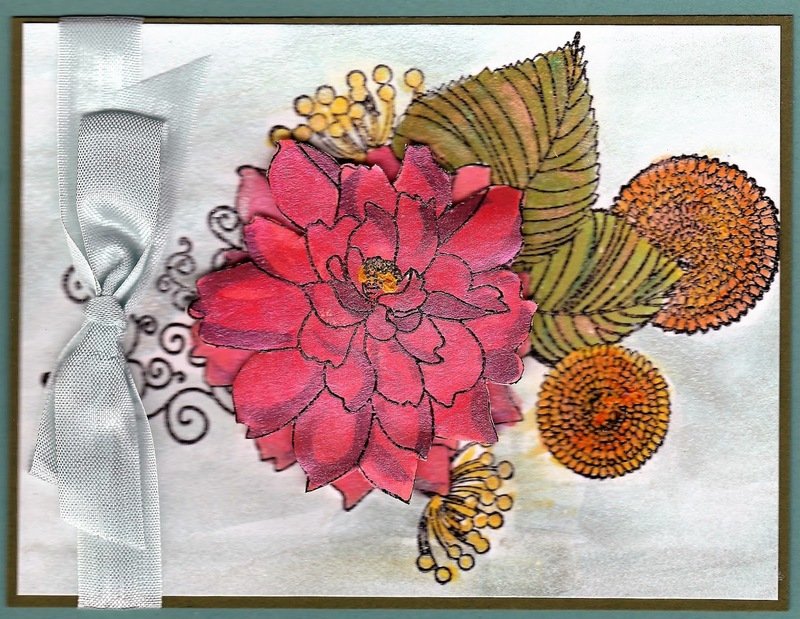 A ribbon and a couple of card stock layers were used to finish the card. 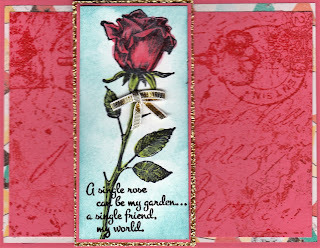 To create this beautiful Mother's Day or Happy Birthday card i used several Technique Junkies, stamps -- Long Stemmed Rose - www.techniquejunkies.com/long-stemmed-rose/, Key Script - http://techniquejunkies.com/key-script/ , and Veined Marble - http://techniquejunkies.com/veined-marble/ . The rose was stamped with Memento black ink and colored with Copic markers. The sky was sponged with a pale blue ink. The other two stamps were stamped in the same shade of ink as the paper for interest and dimension. 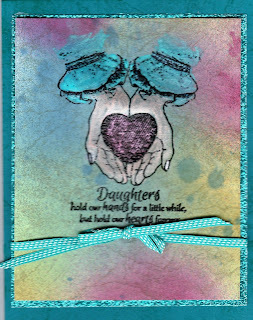 This lovely card uses a new Technique Junkies Stamp from the April Releases called Heart in Hand - www.techniquejunkies.com/heart-in-hand/ . I used Antique Glimmers and stamped the image on top with black Versafine ink and heat embossed. Then I used Twinkling H2Os to water color the image. A coordinating ribbon was tied around focal image card layer. Glimmer paper was added as a layer to add interest and dimension. And from April 1- April 8, you will automatically receive a 15% discount on the Technique Junkies Stamps April releases. Discounts are not given clearance or the Distress Oxide products. and A Single Rose - www.techniquejunkies.com/a-single-rose/. The image was colored in with Copic markers. 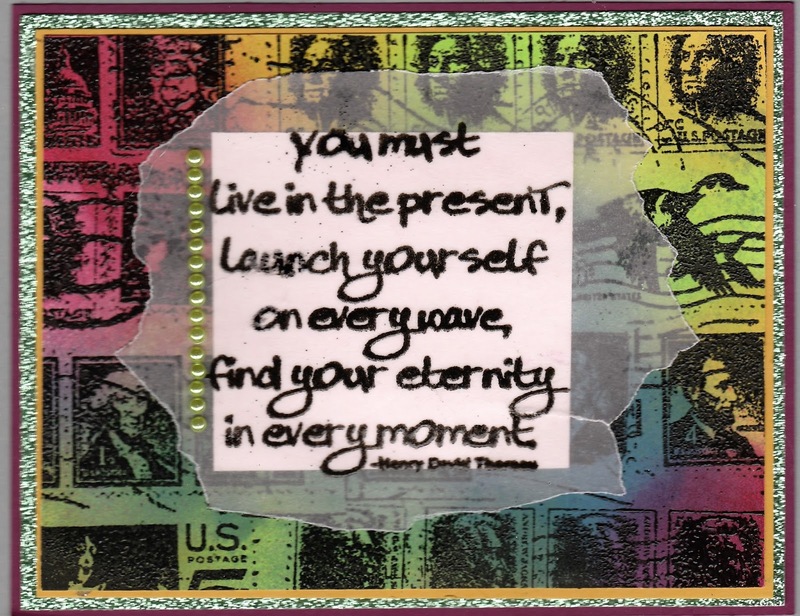 The verse was heat embossed on vellum and layered on a small piece of card stock and then adhered to the card front. I tied several lengths of ribbon around the side of the focal card layer before tying a bow. So now go shopping, do some stamping, and get inky! Oh Wonderful April! Wonderful NEW Stamps! And A New Blog Hop!! There is MORE wonderful news! 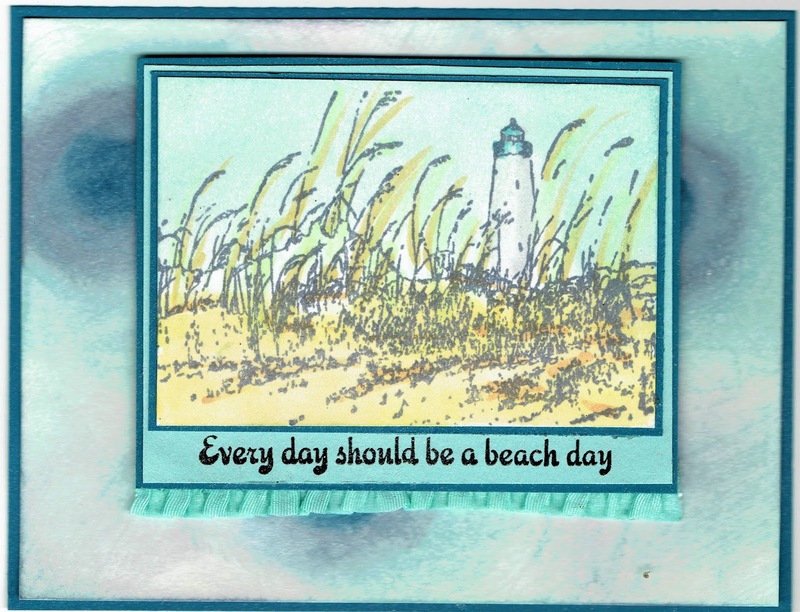 From now through April 8th, you will receive 15% off the NEW April Release stamps -- PLUS you can receive 10% off anything else you order using this code:TJ10Judy (all discount codes excludes clearance and and newly available Distress Oxide Inks and Reinkers). The April stamp discount will automatically be added at checkout. We can all use a bit of savings, right? Blog Hops are always so interesting because we all get to see how each designer interpreted the stamps on their own projects. You should start the Blog Hop at the Design Junkies blog - http://techniquejunkies.blogspot.com/ . You should have come to me from the artistic Beth Norman: http://www.sunflowers-dragonflies.ca/. My first card to share with you is this unique Mother's Day card. 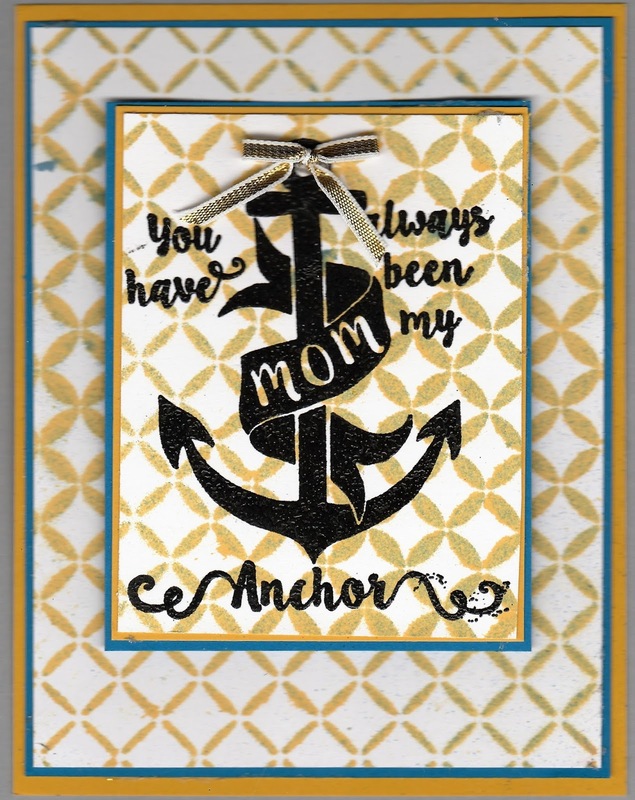 Anchors are usually thought of for men's card but this stamp is perfect for many, many Moms out there! 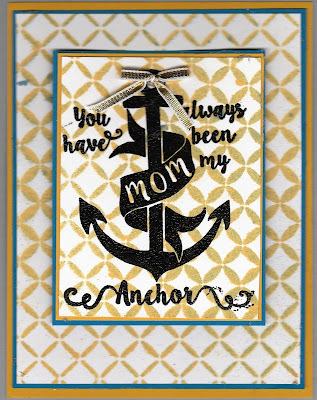 I used the Technique Junkie stamp Mom Anchor - www.techniquejunkies.com/mom-anchor/. It is stamped with black Versafine ink and covered with black detail embossing powder and heat embossed. Both the focal image panel and the bottom background were created with the Medallion Fade Stencil - http://techniquejunkies.com/medallion-fade-stencil/. 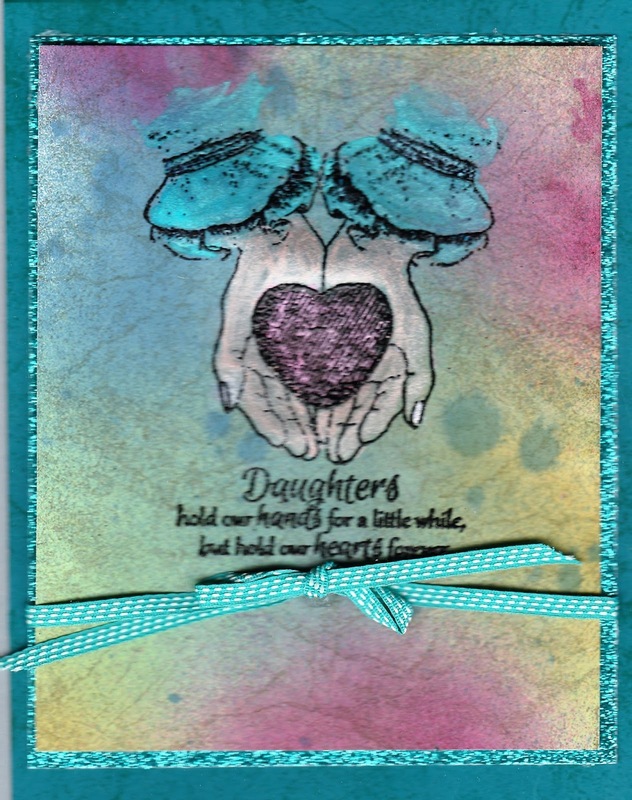 My second card for you today uses two new releases from Technique Junkie April release stamps. I used Long Stemmed Rose - www.techniquejunkies.com/long-stemmed-rose/ and Happy Mother's Day - www.techniquejunkies.com/happy-mothers-day/. Both were stamped with black Versafine ink, covered with detail black embossing powder, and heat set. I used Twinkling H2O's to color in the rose. I tied a small bow and attached it to the rose stem with a glue dot. I used lots of layers of card stock and background papers. The end of the verse panel (ending in Day) is popped up with dimensionals and the other end is adhered with adhesive form my ATG gun. Any Mom would be pleased to get this card! 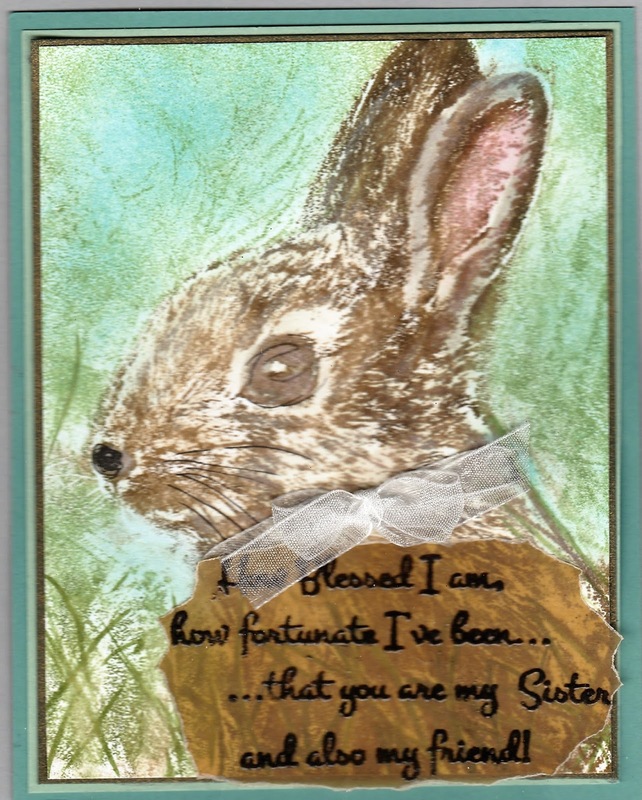 My third card uses a March release - Big Bunny - http://techniquejunkies.com/big-bunny/ , and the April Technique Junkies Stamps release - How Blessed I Am - www.techniquejunkies.com/how-blessed-i-am-set-of-8/. I used my MISTI - http://techniquejunkies.com/misti-most-incredible-stamping-tool-invented/ and dye based markers to color in the bunny. I made two small slits near the neck of the bunny and pushed ribbon through the slits and tied a bow. 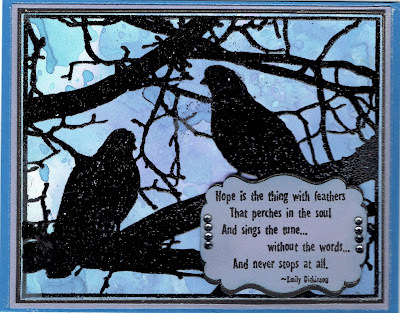 I stamped the verse on a piece of vellum, heat embossed it, and adhered it to the card with my Xyron machine. 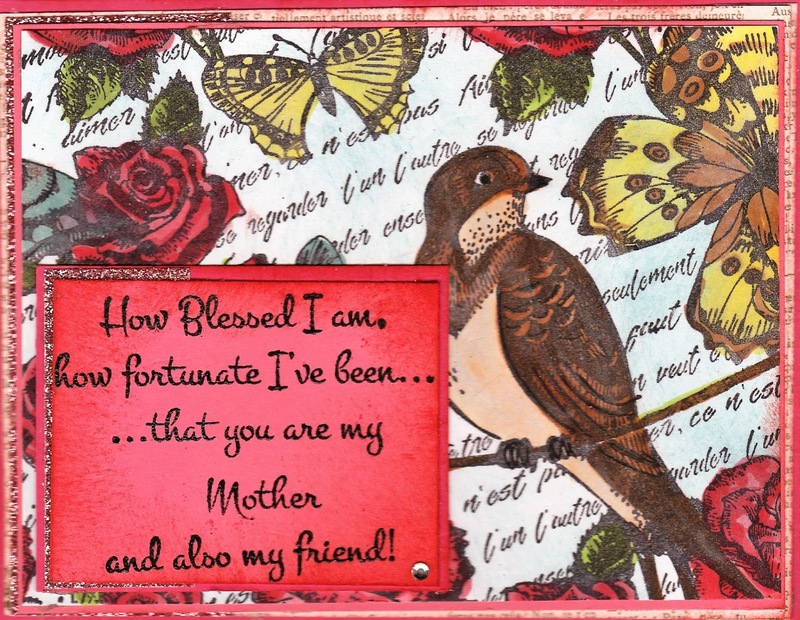 My last card uses the April Releases How Blessed I Am - www.techniquejunkies.com/how-blessed-i-am-set-of-8/, and Flowers and Feathers Collage - http://techniquejunkies.com/flowers-and-feathers-collage/ .
. I colored the butterflies, birds, and flowers with Copic markers. The verse is heat embossed on card stock, and glimmer paper and card stock are used to add layers. I hope these cards inspire you and encourage you to go shopping at the Technique Junkie website - http://techniquejunkies.com/ for not only the April releases but all of the wonderful products Pat sells. And did you know that Technique Junkies now has their own Facebook group wall! Come and share the fun with all of us. https://www.facebook.com/TechniqueJunkies/. Here is the entire line-up of the Design Team Blog Hop. Please hop along and enjoy all of the eye candy provided for you today. Pat Huntoon: http://patstamps.blogspot.com/ - the wonderful Pat Huntoon is next! Have a wonderful Weekend and get inky!